It was the second day of our Thailand trip, that includes Coral Island tour with lunch as per our package itinerary. Our cab picked us from our hotel at 9:00 a.m. to the Pattaya beach side, from where many groups were about to transfer to Coral Island (Ko Larn). The day was great, as the sky was pretty clear. The sunlight was reflecting the sea waves at time to time. We were taken in a ferry and transferred to a big boat to para-sailing point. 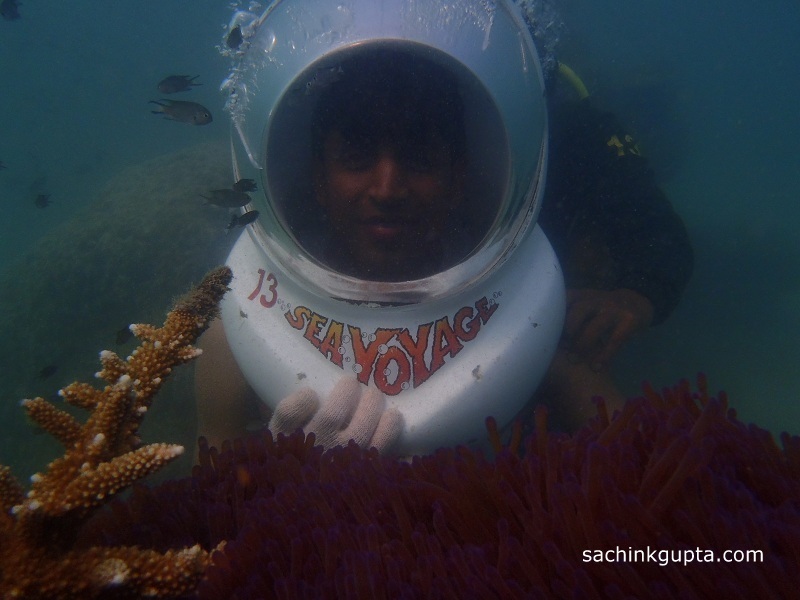 We clicked some nice snaps all around the big boat, and skipped para-sailing as both of us have already done this. 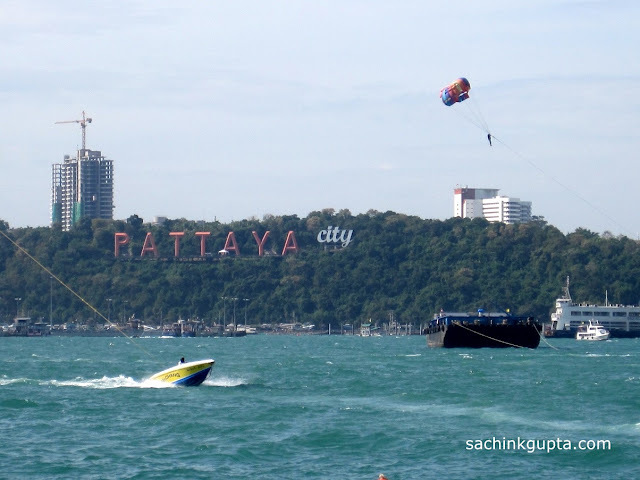 We found some time to get some flicks of Pattaya beach panoramic view, para-sailing, speed boats, and amazing aqua sea. 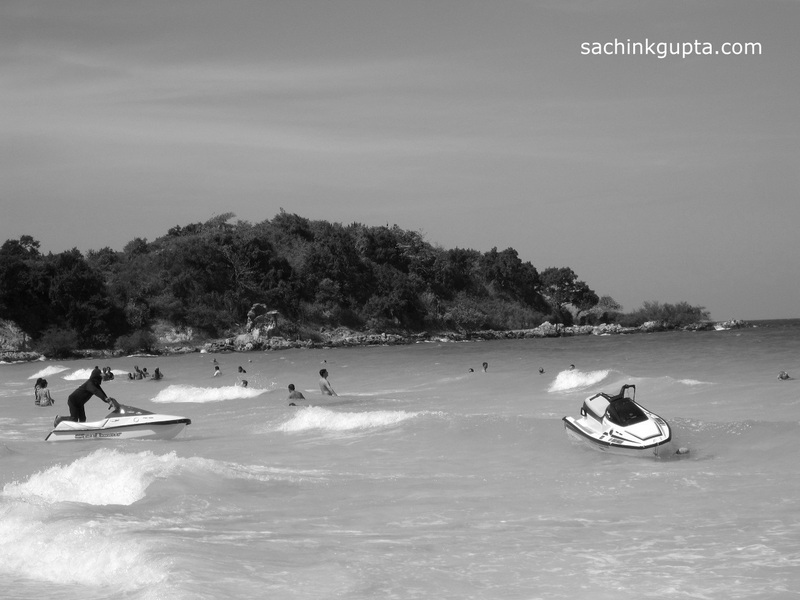 After that we proceeded to Coral Island [Koh Larn] that is 45 mins ride by boat approx 7 Km from west of Pattaya. It was an amazing joyride by ferry boat, that was jumping off the sea-shore again and again. 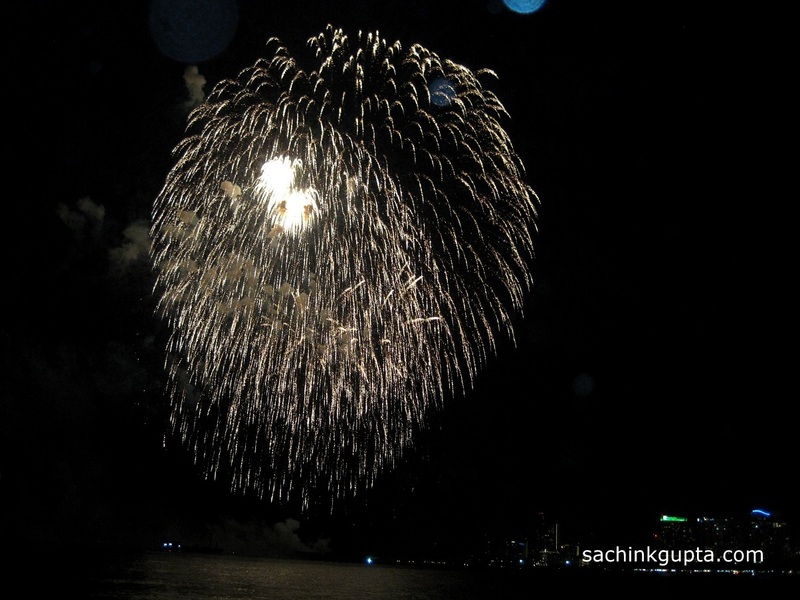 At time to time, It was sprinkling sea water drops from front to back on us. 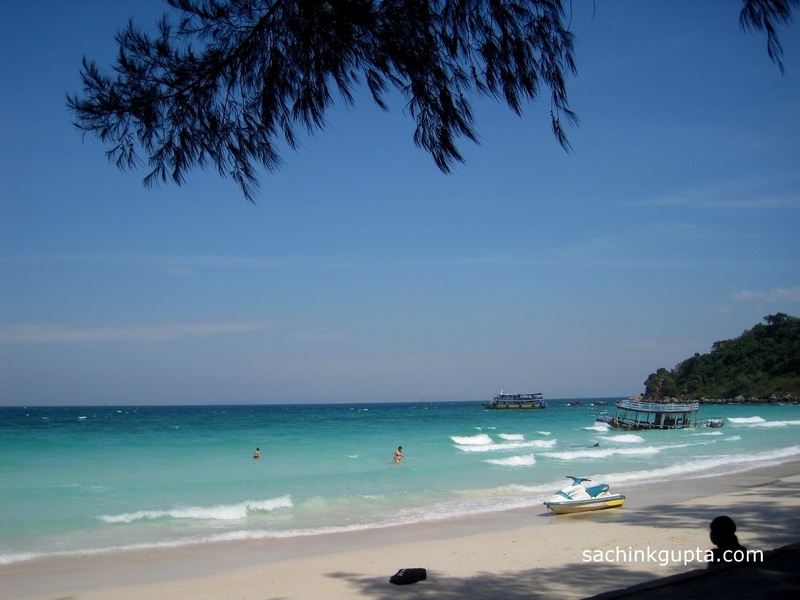 Coral Island (Ko Larn) is the best known out of a group of small islands a few miles off the coast of Pattaya. It is popular with day visitors who want to spend a day on a wide sandy beach and do some snorkeling and undersea activities. It is known as 'Island of Tranquility' as it offers a change of pace from the busy beaches of Pattaya, its tranquil surroundings, beautiful beaches, glass-clear waters and extensive coral. Delicious seafood lunch is served on the island. Koh Lann is a lovely spot catering to all kinds of tourists. Whether you want to laze around on the island's soft, white sand (somewhere golden as will), or get more lively and play a few water sports is up to you at your own leisure. The island offers parasailing, water-skiing, jetskis, snorkeling and deep-sea diving, where there is an abundance of coral and undersea life waiting to be discovered. You can also take a ride in a glass-bottom boat to admire the underwater coral life or put-on your diving equipment to get even closer below the waves. We also experience the undersea walk (Seafloor walk). It costed 3400 THB for both of us, including snaps. Unlike my previous undersea walk in Cyprus (was from the sea-shore), This time we were taken down besides the ladder, and it took no time to build my confidence going down. 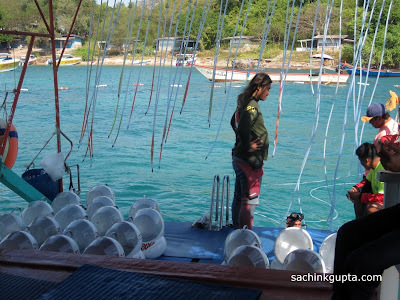 The organizers put helmet masks on our shoulders just before going undersea water. Our breathing devices were connected to the boat for all the undersea walkers. We were experiencing live undersea screensavers among various small and big fish with extensive coral. The organisers ask us to touch and feel some different kind of fish. We feed the fish many times. It was about 40 mins real time undersea adventure. This place has sufficient facilities to support a day-trip. After that we have free time to have fun at the coral island beach. The beach was so clean and crystal clear. At the first glimpse of the beautiful beach, We got the feel just to stay here much more longer. We were last to ride on our ferry back to Pattaya. After that we returned back to Pattaya and have our Indian buffet lunch. 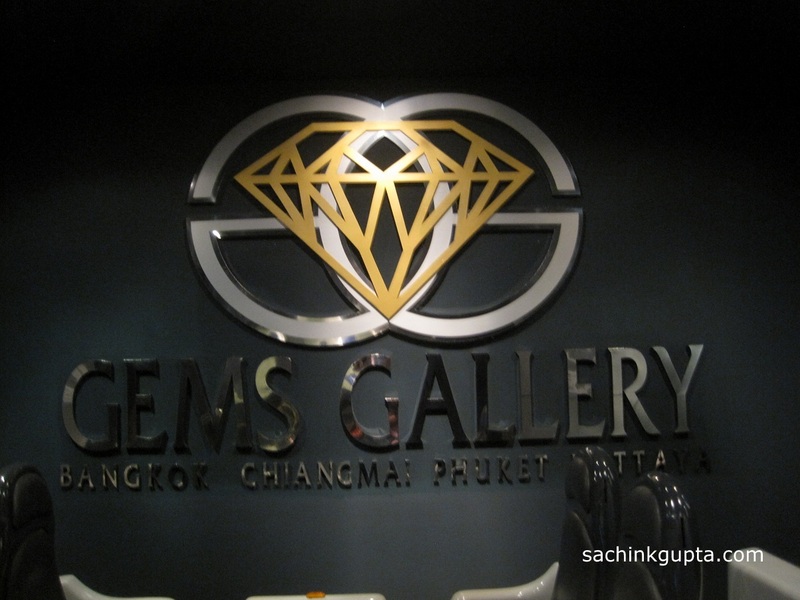 It was time to visit world's biggest jewelry store 'GEMS GALLERY' in Pattaya. 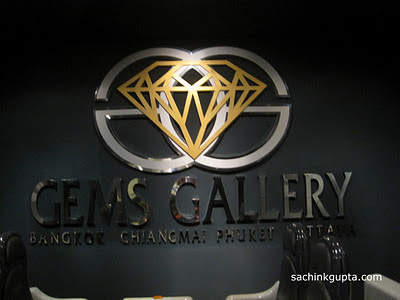 There was amazingly amazing collection of various GEMS, and at the welcome itself, they showed us how gems being molded and then refined at further stages. At the dusk timing, We walked to the 'CentralFestival Mall'. Pattaya is famous for different sort of massages and fish massage was quite different experience to see. 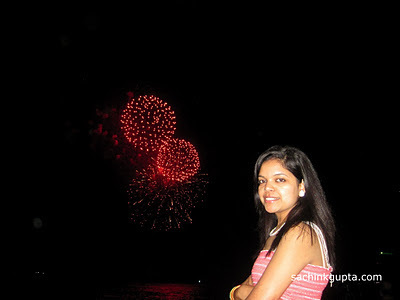 As the day kissing the night, It started amazing fireworks at the beach road and we enjoyed it throughly. It was like the Christmas or New Year celebrations. It was really a beach walk to remember for us. The road was being more crowded at night, and no vehicles were allowed on beach road and famous walking street from 6:00 p.m. to 2:00 a.m.
We keep on walking till Pattaya city sign board on a small hill near 'Bali Hai pier' passing through the glittering of 'Walking Street'. 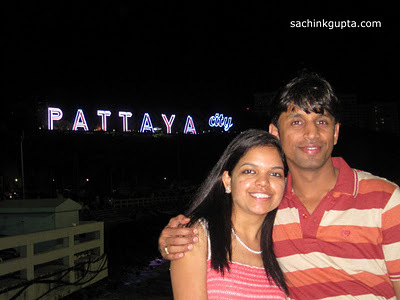 Walking Street Pattaya is probably the most exciting street in the world if like to have fun and enjoy night life. Here you will find all kinds of entertainment, from discos, pubs, live music venues, go-go-bars, cabaret shows and much much more. One bizarre (to me) thing to taste here was egg mixed with Mango and banana. We have the veg pizza after searching a lot for the dinner, and back to the hotel. This was the perfect day to enjoy with Meenal and these loving moments will be in our memory forever. Other places to must visit in Pattaya: "The Sanctuary of Truth"
An eve in Pattaya, Thailand: "Mini Siam and Tiffany Show"
A day in Bangkok, Thailand: "Bangkok City tour and evening cruise"
Nice place and good photography dost. Keep enjoying. All the best !!! It was a lovely description bro. Seems u had a lot of fun. The place is indeed beautiful. May I know how did u plan up for this place and how much was the total expenditure(I guess you went as a couple) and would May and June be a fine season to hit there. Any other vital info would be appreciable. We choose "Dial-o-Flight" for the package 40 K INR that include flight + hotel stay for 3 days (2 in Pattaya and 1 in Bangkok) + all major daily tours to different places. Sanctuary of Truth is a must visit place near Pattaya. Best time to visit is Dec to Feb round the year. During May-Oct most of the days are raining ones. Not suggested time to visit. 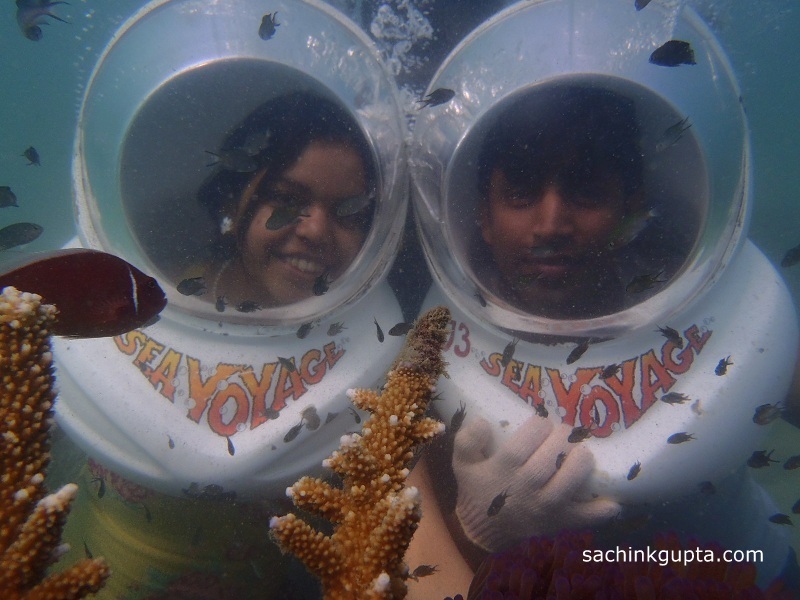 Undersea walk was an amazing experience, it was the second time for me, but for my wife it was the first time. With the help of experienced team, it was quite smooth, even we enjoyed undersea walk in Pattaya a lot. Nice info & photos in the post. Helpful. Really not to be missed place. Where did you keep your belongings n valuables when you went for underwater sea walk in coral island? Of course holidaying on the island has to be full of activities that is why Coral Islands which is located South of Phuket stands out among Islands in Phuket. A full day trip to Coral Island will give you memorable experience of both water and land activities.Coral Island Tour Lots of sporting activities to indulge in with various voyagers like you. 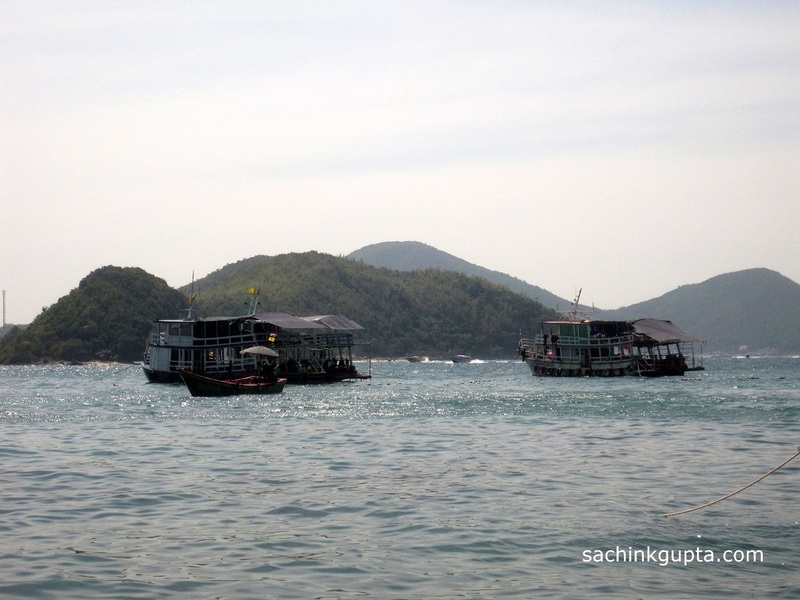 Coral Island is believed to be the number one snorkeling and water sport destination in Phuket which is why the Island still remains unchallenged when it comes to offering clients a holiday on the Island filled with sporting activities. just chat with https://mythailandtours.com/ to get best valued tours ! I have been in this city for 2 times, and I like it, but honestly I like Chiang Mai more, I suppose it all because of amazing landscapes and mountains. Especially in cool before sunset, when only u, nature and your bike, that u rented here http://catmotors.net/tips-for-riders/ on fine service that have only trustworthy bikes. All these are the places are the featured destinations of all the Thailand Tour Packages and are blessed with exotic charm and beauty that never fails to impress the heart of tourists. http://eliburan.com/bangkok-ratchadamnoen-avenue/ Truly it will be a pleasant experience to explore the sheer wonderments of Kata Beach on Thailand tours. I wanna .. Like no other ..